The Punjab government banned the use of media drones in Lahore where the PTI and PAT rallies originated before converging on Islamabad. 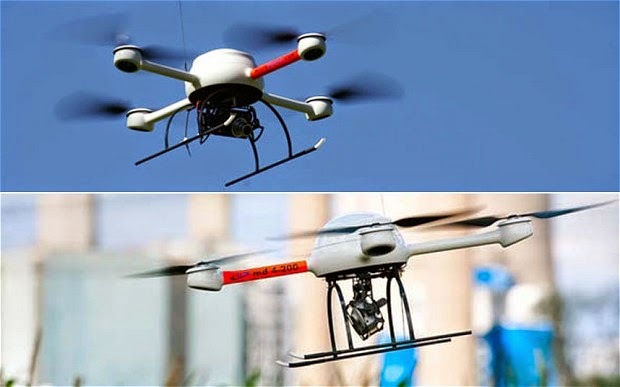 “We have banned the use of helicams/drone cameras after the Ministry of Defence has informed us in writing that the use of such flying devices by anyone except the authorised state agencies is already banned under certain rules and regulations related to civil aviation, etc,” District Coordination Officer retired Capt Muhammad Usman told Pakistan's Dawn newspaper. In Islamabad, however, there have been half a dozen drones in the air covering the combined PTI-PAT dharna (sit-in) round the clock for the last several days. “We were stopped from using these machines yesterday to cover the placement of the containers because the authorities have become sensitive about it,” says Nadeem Ihsan, senior manager (technical) of Samaa TV, which says it used the drone camera the first time in Islamabad during the coverage of the PTI’s earlier public gathering at D-Chowk on May 11. Pakistani authorities remain cautious about the growing use of these new drones. “We are concerned that the number of these drones may increase to an unlimited level and that would be alarming. We need to make rules to control this technology,” a senior administration official said. 1. In December 2011, a Fair Elections rally in Moscow used a remote-control model helicopter to get government-independent aerial photos of the crowd. 2. In summer of 2013, a drone videotaped a police clash at a demonstration in Istanbul. The drone was reportedly later shot down, apparently by police. 3. In March 2014, a business systems expert shot half an hour of aerial video in East Harlem after a gas explosion demolished two buildings. 4. CNN has an ongoing request for crowdsourced drone aerial footage. 5. Using drone imagery, Wake Forest University created a 3D model of Duke Energy’s coal ash spill in North Carolina, independent of the utility-favoring state regulators. 6. Drone maker DJI has demonstrated spectacular video of its Phantom drone flying into a volcano in the Tanna island of Vanuatu. 7. In 2012, a camera drone flying near Dallas discovered blood-red spots in the Trinity River. It turned out that pig blood was being emptied via an underground pipe from the Columbia Meat packing plant, located on a creek that feeds into the river. The company was indicted on 18 criminal counts, and a trial is pending. The civilian drones are coming. Some drone makers would like to see them swarming the skies soon. But others are horrified at the prospect of so many drones flying overhead. Before the drone usage becomes widespread, there will have to be reasonable regulations in place to address safety and privacy concerns of the public at large. Geo News, Pakistan’s most popular news channel, is in the process of experimenting with 2 DJI Phantoms, plans for which call for assisting in gathering footage for the network. They are described as “commercially available Unmanned Aerial Vehicles,” or, in other words, unarmed drones. While his counterparts in America are compromised by FAA regulation, Geo Online editor and de-facto drone pilot Shaheryar Popalzai had first-hand experience with the technology in March. “It's only a matter of time before news (organizations) understand the benefits of using UAVS, and how they can help with the news,” he says. For GEO News, which suffered an attack on its prominent anchor, Hamid Mir, last weekend, drones offer safety and the ability to cover topics in greater detail. When the network dispatched a team to the Tharparkar district of Sindh to cover a drought, producers sent Shaheryar Popalzai as a drone pilot. When the segment aired in early April, it was the first of its kind. National disasters such as the drought in Sindh are often reported with a lack of visuals, according to Popalzai. When it comes to conveying the living conditions of those affected, he says Pakistani news segments rely too heavily on statistics, sound bytes from officials, and stock visuals to tell a story. “Our main aim when we took the UAV out there was to show how far and isolated these people are,” says Popalzai. Actual footage of the affected areas has been in short supply. Networks have been airing the Pakistani government’s officially sanctioned footage, which focuses on aid packages being dropped out of a helicopter, but that leaves out those affected by the famine, and most of the landscape in which they live. While a significant portion of Pakistan’s population lives in such a manner (the world bank estimated 63 percent in 2012), they remain disconnected from the remainder who live in the country’s urban centers—which are among the largest in the world. For the handful of journalists and filmmakers who use drones in Pakistan, using them to cover urban issues still poses a risk. “Whoever is flying it has to be within range and this can mean they have to be in the open. Once you’re done shooting you need to land the UAV as well, making yourself vulnerable when you’re done landing and picking it up,” Shaheryar says. In 2012, the Pakistani news channel Capital TV sent 20-something Shehzad Hameed to cover Imran Khan’s election rally at Liaqat Bagh, a garden in the city of Rawalpindi. He was given a satellite backpack that created a 3G wifi network to download footage in real time, from an aerial drone. “Compared to our usual satellite van, there were less hassles involved with setting up a live feed in a congested place. All the technology was in my backpack,” Hameed says. There was, however, a technical oversight. “Pakistan is not the coldest country in the world. After one hour of getting great footage, the backpack over-heated,” he says. “We had to leave it under a tree to cool down.” In the end, they had to rely on their older, trusted satellite van to provide live footage. The experiment was not the success his channel was looking for. Huge anti-government demonstrations in Pakistan entered their second week with thousands of protesters surrounding and blockading — peacefully, so far — the parliament building in Islamabad. Two groups of protesters from different opposition parties first converged on the capital Aug. 15, demanding resignations of Prime Minister Mian Nawaz Sharif and his brother, Mian Shahbaz Sharif, the chief minister of the Punjab state. The public face of the demonstrations is the charismatic cricket-star-turned-politician Imran Khan, leader of the Pakistan Tehreek-e-Insaaf party, which placed third in last year’s elections. The other party, Pakistan Awami Tehreek, led by a moderate Islamic cleric, Professor Allama Maulana Muhammad Tahir-ul-Qadri, won no seats at all in the vote. Khan claims that last year’s election — which marked only the second democratic passage of power in Pakistan’s six-plus decades of independence — was tainted by massive voter fraud. He has not, however, released any evidence to back the charges, which were not supported by international observers. Khan says he will make his evidence public only after the government resigns. The situation in Islamabad as night fell Friday was tense but not violent. The demonstrators scored a victory on Thursday as the Supreme Court denied the government’s request to order the protesters to disperse, but demonstrations around the country have been broken up by police, with many arrests. More than a dozen protesters were killed in a clash with police in June. They are saying that PR is falling now to 101 per dollar because of bad economy or protest. Is this correct???? Riaz bhai What's the origin of these drones? Any Pak company selling them or all imports? Forget the soapbox - the must-have accessory for the modern politician in Pakistan seems to be the shipping container. Even Imran Khan is said to have spent more than $120,000 (£70,000) on one, reports Fahad Desmukh. "These containers that you have placed on all four sides are not enough to stop this ocean of people!" declared cricketer-turned-politician Imran Khan at a rally on Tuesday night. He was addressing Pakistan's Prime Minister Nawaz Sharif, and the "containers" he was referring to were shipping containers. The government had placed hundreds of the giant steel boxes on Islamabad's roads to block protesters and stop them moving freely through the city. But the marchers brought cranes with them, moved the containers out of the way, and are now camped out at the gates of parliament. For the past week and a half, Pakistanis have been glued to their TV screens to see what will become of the latest attempt to topple the government. The new push is being led by two different forces. One is Khan, whose party won the third highest number of seats in last year's elections. The other is Tahir ul-Qadri, a religious leader holding Canadian dual-citizenship. The men are leading separate sit-ins in Islamabad, hoping to force Sharif to resign. For the past five years, the government has placed containers near key state institutions in all Pakistan's major cities, ready to be moved into position whenever a mob approaches. Many of the containers have the official police logo painted on them so that there is no question about ownership. But party workers have discovered that containers make excellent stages for rallies and they are now an essential item for any big political event. To the endless fascination of Pakistan's media, they can also be converted into mobile homes. 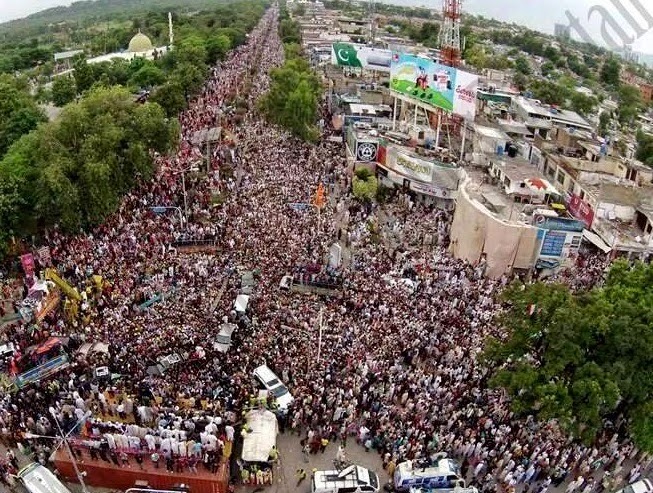 In January last year, ul-Qadri held a four-day sit-in in Islamabad. While his supporters were out on the street, he slept inside his customised container, fitted with heating and a bathroom. Recently it was widely reported that Khan's party had had a container converted at a cost of some 12.5m Pakistani rupees ($124,000; £75,000). The BBC contacted their office but they declined to comment on that figure. It must be said that in TV reports the box does not come over as the last word in luxury. But it is equipped with meeting facilities, a bathroom, and a nifty spiral staircase leading to the roof - and is supposedly bomb-proof. Protest leaders and government in Pakistan are both using shipping containers...Imran Khan and Tahir ul Qadri use them as homes and stages for speakers while the government relies on them to block protesters. Here's a video of Imran Khan's "luxury" container. About $1 = PR 101. Actually, the rupee needs to fall further because that will increase exports which have been stagnant due to competition from other countries like China. Also, it will increase remittances. The government doesn't want rupee to fall because it doesn't want petrol and oil prices to go up. All the oil is imported. Boys and girls dance in the PTI rallies in Constitution Avenue, fume the clerics of the Jamiat Ulema-e-Islam led by Pakistan’s leading political acrobat, Maulana Fazlur Rehman, with his uncanny ability to be part of every power setup no matter what its colour or stripes. What should the boys and girls do instead? Attend tutorials in suicide bombing? Study how to make the most of diesel permits, the word diesel forever associated with the Maulana’s name? What hypocrites are we dealing with here? On a TV talk show I had the misfortune to be part of, Senator Hafiz Hamdullah of the same party described the PTI ongoing rallies as a nightclub show. I looked up in surprise and asked the maulana that as a man of the cloth how did he know what a nightclub was? Had he ever been in one? Smirking, he gave no answer. Maulana Fazlur Rehman has described the dharnas as an onslaught of ‘western culture’. At least he is being original, no one taking this line before. His problem is simple. Imran Khan’s PTI is now a power in Khyber Pakhtunkhwa where in happier times the Maulana stood tall and imposing. He doesn’t like this one bit. Hence his anger. Mufti Muneeb-ur-Rehman who as head of the Ruet-e-Hilal Committee never fails to send the entire nation into fits of laughter as he squints into the telescope to see whether the Eid moon has arisen, has also denounced the PTI rallies. If he had come out in the PTI’s support, that would have been something to worry about. We should understand this phenomenon. No self-respecting maulvi true to his calling can abide the spectacle of men and women enjoying themselves. Their stuff is hellfire and denunciation, not singing and dancing. And they have a problem with women. For some reason rooted deep in their understanding of theology, they want to keep them under lock and key. Venus has never been more triumphant than in the morbid nightmares of the ulema. Balochistan government decided on aerial surveillance of criminals in an attempt to regain stability in the province which has been wracked by ethnic, sectarian and militant violence. Balochistan govt wrote a letter to the federal government seeking permission to deploy surveillance drones in the province, sources reported. The provincial authorities announced on Saturday that it would purchase drone cameras to monitor the activities of criminals. Home Secretary Akber Hussain Durrani told a local media outlet that the govt has forwarded a summary to the FG seeking permission.